Cancer is such a scary word, no matter how it’s spoken. Peace of mind taken for granted, can be crushed and forever broken. But together we could fight this! It’s an enemy from within us, striking oh so randomly. Tomorrow it could be you, for yesterday it was me. So together we should fight this! While science is advancing, my heroes still are dying. Some treatments just aren’t working, but still we’ll keep on trying. And together we will fight this! Research is the magic word, it’s what we want to see. Nothing less than a cancer cure, would mean so much to me. For together we have fought this! It’ll take support from everyone, to really see this through. So peace of mind for all of us, can start off fresh and new. And together we will win! 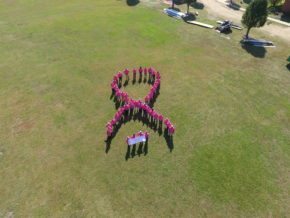 *Picture of Chester County employees honoring Breast Cancer Survivors and those that lost the battle. Picture taken by Catawba Regional drone services.